The Garmin Edge 500 is a high end, feature packed cycle computer, much like the Polar CS500 that I reviewed last week. However, the way that the Edge 500 goes about its business is very different from the Polar. In fact, despite both devices being targeted at similar users, they’re actually poles apart. Polar’s history is firmly set in heart rate monitor technology, while Garmin is one of the biggest names in GPS tech. 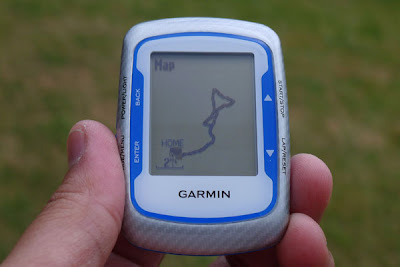 As such, the technology inside the Edge 500 is based on Garmin’s expertise in the world of GPS, with all the other functionality hanging off that well established constant. 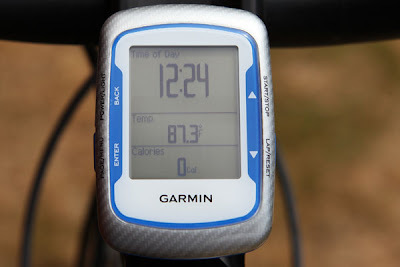 The beauty of using GPS technology for something like a cycle computer is that you can get the vast majority of required data without the need for any other form of sensor equipment. 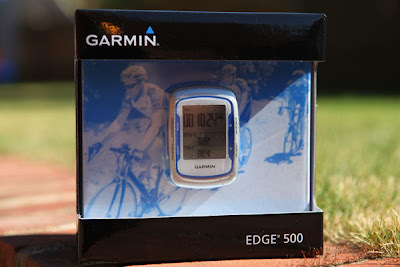 Obviously there are exceptions, but Garmin has those covered with this Edge 500 bundle. 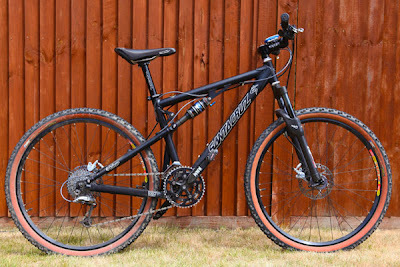 In fact, it’s safe to say that as cycle computers go, the Edge 500 has pretty much every base covered, and then some. Although the Edge 500 is a very competent, well featured cycle computer in stand alone form, you do get some useful extra bits and pieces in the box. First up is an ANT+ heart rate monitor and chest strap, which connects to the Edge 500 and records maximum, minimum and average heart rate for your ride. 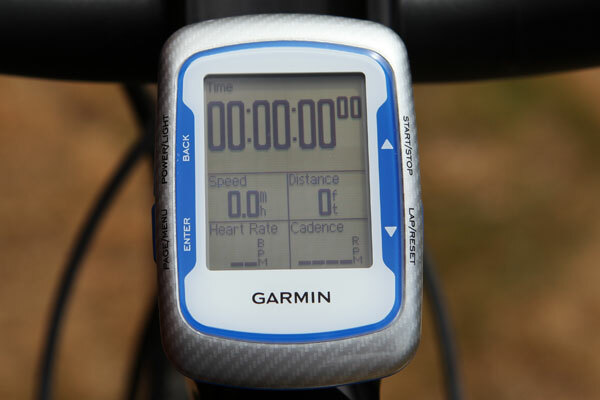 Obviously the Edge 500 will also display your current heart rate in real time while you’re riding. It’s slightly disappointing that the bundled heart rate monitor is one of the thick plastic types that covers your entire chest, rather than one of the smaller units that Polar tends to ship with its kit. This is compounded by the fact that Garmin does offer a small heart rate monitor with a soft strap, which it dubs the Pro Heart Rate Monitor, but that’s an optional extra that will set you back around £50. That said, I noticed a few Internet retailers that are selling the Edge 500 bundled with the Pro HRM instead of the standard one, so it’s worth shopping around. There’s another ANT+ wireless sensor in the box, this one measuring speed and cadence. Although the Edge 500 can measure both speed and distance via GPS, many, myself included, prefer to have a proper speed/distance sensor mounted on the bike for a more accurate reading. In all fairness I found the Edge 500’s GPS readings to be pretty accurate, but you’re always running the risk of losing a satellite signal if you ride through dense forest or between tall buildings. You also get a mains charger with UK, European and US power plug adapters. It’s good to see Garmin bundling a charger, since many devices these days just ship with a USB cable so you can charge from your computer, leaving you to stump up the cash for a mains adapter if you want one. Given that the Edge 500 has a built-in GPS receiver, it comes as no surprise that it has a rechargeable battery, thus saving you the cost of disposable battery replacement. On the downside though, if you forget to charge the Edge, you could find yourself either postponing a ride or recording no data. Garmin quotes that you’ll get around 18 hours of use out of the Edge 500 when fully charged, which means it should be good for a few rides even if you happen to be riding around France right now! You can also configure the Edge 500 to switch itself off after a period of inactivity to conserve battery life. Garmin scores some extra brownie points by shipping two bike mounts with the Edge 500. This is particularly useful, since the device can be used quite effectively without the speed and cadence sensor on your second bike. 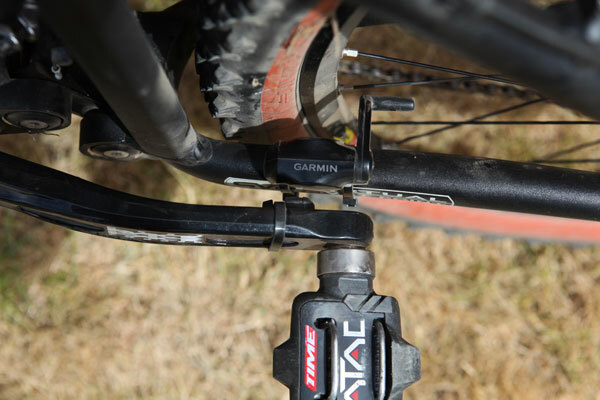 It’s also good to see a mounting system that doesn’t require the use of cable ties – instead the Garmin mount utilises rubber o-rings to effectively secure itself to your handlebars or stem. There are different sizes of o-ring supplied to ensure that you can mount the device on your bike no matter what size your stem or handlebars. You also get a standard USB to mini-USB cable for connecting the Edge 500 to your computer, while a paper quick start guide and a full user manual on CD round off the package. The Edge 500 is a very versatile cycle computer and there’s a huge feature set for the new user to get their head around. However, that doesn’t mean that it’s difficult to get up and running, because you really can be out riding and logging data in a matter of minutes with this cycle computer. Obviously the more time you spend configuring the device to your own, personal needs, the more you’ll get out of it, so it’s worth spending some time on initial setup. The first thing you’re going to have to do is charge the device up, which can be done via your computer, with the bundled adapter, or any other mini-USB mains adapter that you may have knocking about. 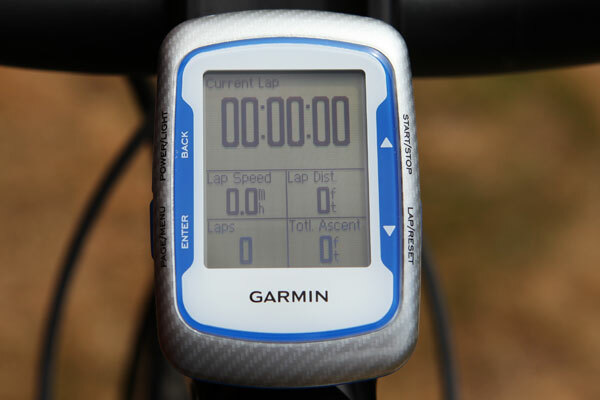 While the Edge 500 is charging up, you can keep yourself busy by attaching the speed and cadence sensor to your bike. The combined speed and cadence sensor is actually a pretty ingenious piece of kit, and means that you don’t need to have anything mounted to your front forks – where speed sensors are traditionally found. 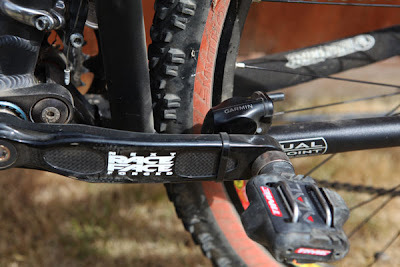 The sensor mounts to the non-drive-side chainstay and is held in place by two cable ties that thread through holes in the casing. The magnet for the cadence sensor is then stuck to the inside of the crank arm using a sticky pad, and then secured using another cable tie. You then need to adjust the position of the sensor until the magnet passes within 5mm of it. The speed sensor part of the equation can be adjusted independently by loosening a screw – you can then move the speed sensor closer to, or further away from the rear wheel spokes. Once the magnet is mounted on a spoke, you need to adjust the speed sensor so that it’s once again within 5mm of the magnet. 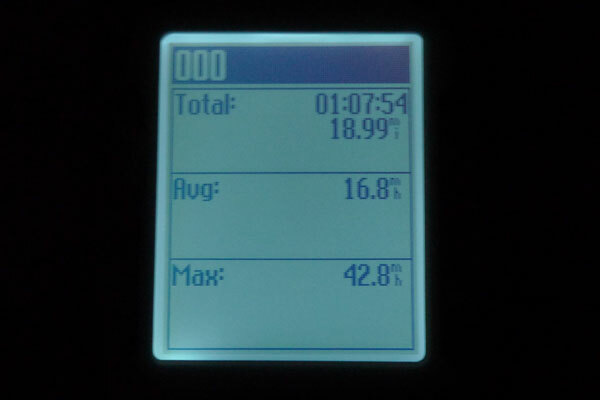 And there you have it, speed and cadence readings without the need for sensors and magnets at both ends of the bike. Although you can manually measure the size of your wheel and input that data into the Edge 500, there’s an auto wheel size function that will calculate this for you. This will be done on your first ride, and usually takes no more than a few hundred yards, with the Edge 500 flashing a message up to tell you that your wheel size has been calculated. When you turn the Edge 500 on for the first time it will take you through an initial setup routine. Here you’ll be asked for your personal information like height, weight, age etc. You’ll also be asked whether you have a heart rate monitor and speed/cadence sensor to pair with the device. Obviously all this data can be amended later, but it’s good to get all the basics in place as soon as you switch it on. The Edge 500 picks up satellites very quickly, which is a definite bonus – it can be seriously annoying when you’re all geared up to go for a ride, but you’re left twiddling your thumbs while your GPS device locks on to enough satellites. One of the best features on the Edge 500 is its completely customisable info screens. While you’re riding you can cycle through up to three pages of real time data, but each and every one of those pages can be customised to suit your exact needs. First up, you can configure the number of data fields on each screen from one all the way up to eight! Obviously the fewer fields you have the larger the readout will be, so how many you have will depend, to some extent on how good your eyesight is. Personally I found five fields to be ideal, giving you a large readout taking up half of the display, with four supplementary data fields below it. But that’s not all – not only can you decide how many data fields you want on each of the info screens, but you can also choose exactly what information goes into each field! This means that if you want a screen with your overall ride time, heart rate, cadence, speed and overall distance, you can have just that. Then you can configure page two to display, say, current lap time, current lap distance, number of laps completed, overall elevation and time of day. The customisable info page feature is such a simple addition, but one that makes the Edge 500 a very personal device for anyone using it. You don’t have to settle for the screen configurations that the manufacturer thinks are the most useful, you can create real time info screens that display exactly what you want to see, presented in a manner that suits you. Aesthetic design is always somewhat subjective, but I do feel that the Garmin Edge 500 lacks the visual impact of the Polar CS500. This is partly due to the Polar’s huge screen and also down to the conservative shape of the Edge 500 by comparison. That said, the Edge 500 is small and reasonably unobtrusive, especially when mounted to your stem. I’m not a huge fan of the blue/silver colour scheme, but you can get a black/silver version if you want something a bit more neutral. The Edge itself has a traditional portrait layout, with dimensions of 69 x 48mm and a screen size of 37 x 32mm. This makes the Edge 500 considerably smaller than the Polar CS500, both in physical size and display real estate. The result is that it’s not quite as easy to see the readouts when glancing down at the Edge during a ride, although this can be addressed to a certain degree by configuring fewer data fields, and thus having larger readouts. There are four side mounted buttons – two on each side – all of which are weather sealed. I’m not really a fan of side mounted buttons on cycle computers, since they are far harder to press than front mounted ones. I appreciate that this approach allows for a larger screen in a smaller device, but I’d still prefer a slightly larger computer with a couple of buttons below the screen. Each of the buttons are multi-function, but while the device is in use the bottom left button will cycle through the info pages, the top right will start/stop the timing, the top left will turn on the backlight or power off the device, while the bottom right button handles lap and reset functionality. At first I was very disappointed with the side mounted Lap button, since I far prefer to have a large, front mounted Lap button, making it easy to press as you pass your waypoint or lap marker. I found it a bit of a struggle trying to press the Lap button while travelling at speed, especially when riding off road on bumpy terrain. However, after a little digging through the Edge 500’s menus, I realised that the position of the Lap button wasn’t an issue at all. You see the Edge 500 has a very useful Auto Lap feature, which saves you having to press the Lap button while you’re riding, well, for the most part anyway. Assuming you’re planning to compare set distances throughout your ride, you can configure the Auto Lap function to trigger by distance – so you can have the Edge 500 to start a new lap every three miles for instance. Even more useful is having Auto Lap trigger by position. Having hooked the Edge 500 up to my Santa Cruz Blur mountain bike, I headed off to a two mile, off road training circuit that I use regularly. As I passed my lap marker I pressed the Lap button, then every time I passed that position again, the Edge 500 triggered a new lap without me having to do a thing. The Edge 500 also acts as a GPS logger, so while you’re out riding it will record your exact route, then when you later upload your data to Garmin Connect (more about that later), you’ll find your route overlaid onto Google maps, showing you exactly where you’ve been. While I’m on the subject of route logging, another neat addition is the Courses feature, which allows you to repeat a previous route, while trying to improve on your time. To create a Course, you simply select a previous ride, and give it a relevant name. You can then view that course as a map and follow it the next time you ride. You can also create Courses that you haven’t ridden and upload them to the Edge 500, although you don’t get turn by turn sat-nav type guidance, it’s more like old school waypoint directions. 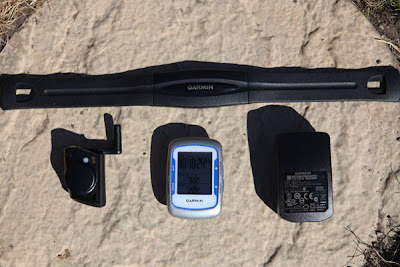 Garmin has taken a far simpler approach to data synchronisation than Polar, ignoring wireless connectivity in favour of a good old USB connection. It may not be as high tech as using a wireless adapter, but it’s very simple to setup and it works. At the rear of the Edge 500 is a standard mini-USB port covered with a rubber bung – you simply connect the device to your computer via the supplied cable and off you go. Okay, so you need to register an account on the Garmin Connect website first, but that’s pretty painless. And once that’s done, you just press the Upload button on the Dashboard page of Garmin Connect, and all your training data will be pulled off the Edge 500 and loaded into the Garmin portal for endless hours of analysis. Assuming you’re using the heart rate monitor and the speed/cadence sensor, you’ll be presented with a huge amount of data, all laid out in clear boxes and charts. 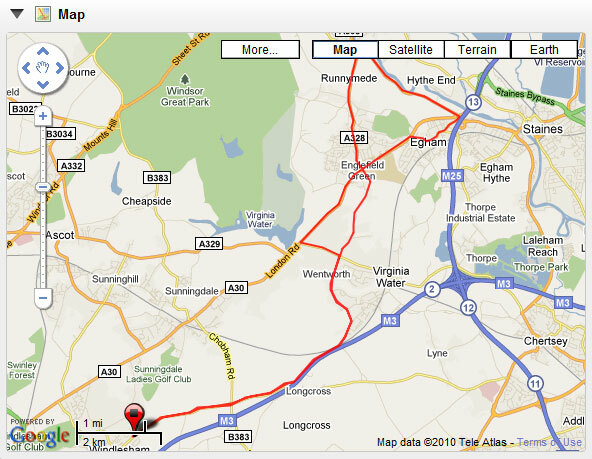 You get the aforementioned Google map showing you the route you’ve just ridden along with a detailed summary of the ride. This summary will include everything from time taken, to distance ridden, to elevation, to temperature, to cadence and of course heart rate. Also presented in the summary is a list of your laps, along with the time taken, distance and average speed of each. 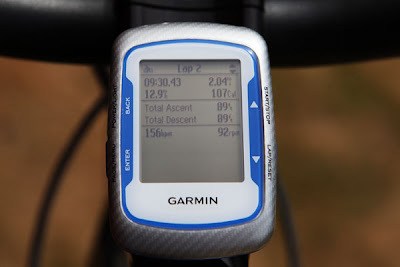 However, if you then click the View Splits button you’ll get the full detail about each of your laps including elevation gained and lost, average and maximum heart rate, average and maximum speed, average and maximum cadence, calories burned and temperature – pretty much all the data you could ever want. Garmin Connect also gives you the option of exporting any or all of your data to a CSV file, in case you’d like to keep track of it offline too. You also have access to a printer friendly layout, so you can keep your data in an actual file, rather than an electronic one. You can view all your exercise activity in a calendar layout, or view it as a list of training sessions. You also have the option to set yourself goals – you could set yourself a goal of riding 100 miles in a week, then each day you can assess how close to that goal you are, and whether you need to step up your training, or even ease off a little. The Edge 500 is a very impressive cycle computer that leverages on Garmin’s unquestionable expertise with GPS technology. The fact that it can be used as a stand alone unit without the need for external sensors will make it attractive to many cyclists straight away. That said, buying the bundle with the heart rate monitor and speed/cadence sensor ticks all the feature boxes you could want, bar a power sensor, which can also be added. I’m impressed that Garmin ships the Edge 500 with two bike mounts and a plethora of rubber o-rings. Considering that most serious cyclists have multiple bikes, being able to attach the Edge 500 to two bikes straight out of the box is a real bonus. The mounts themselves are extremely easy to use, with the device simply twisting on and off – there’s also not even the hint of a rattle, no matter how rough the terrain. I simply love the way you can configure the info screens to suit your own needs, creating different layouts and different data fields for each of the three pages. The positional auto lap feature is also excellent, while something simple like the backlight will make it far easier to use the Edge 500 in the winter. The Garmin Connect portal makes it easy to synchronise, collate and analyse your training data, and if you want to keep local records, you can export the information from the cloud and keep it on your own computer. The suggested retail price of the Edge 500 is £249.99, but a quick look around the web showed that the bundle reviewed here can be had for around £185 from a few online retailers. 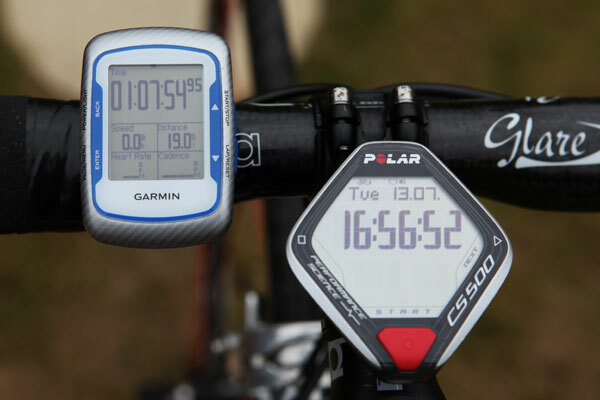 So, which is better, the Garmin Edge 500 or the Polar CS500? I’m afraid that’s not an easy question to answer, since I really like both devices for very different reasons. 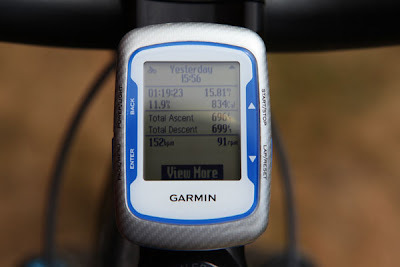 The large screen, and incredibly simply usability of the Polar CS500 make it a joy to use while riding, but then the info screen customisation on the Garmin Edge 500 means that you can tailor it to your exact needs, while the GPS route logging gives you a visual indication of where you’ve been at the end of each ride. In all honesty I think that comparing the Edge 500 and CS500 is simply unfair, since they really are completely different products, with completely different strengths and USPs. With that out of the way, I’ll conclude by saying that the Garmin Edge 500 is a great cycle computer with an impressive array of features. If you’re looking for a device to improve your performance in the saddle, and like the idea of in-built GPS functionality, the Edge 500 should be high on your list.